Jackson Setter demonstrated the full extent of what internships offer when he journeyed to Minneapolis during the height of audit season. Internships provide students with the practical experience needed to take the leap from college to career. 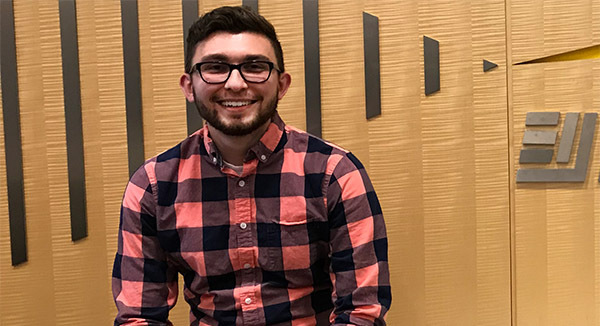 Jackson Setter, a senior accounting major from Paola, Kansas, demonstrated the full extent of what internships offer when he journeyed to Minneapolis this semester during the height of audit season at EY (Ernst & Young). Jackson Setter takes in the nightlife of New York City. Setter began the internship with a week-long training period in New Jersey with other interns from around the country. Every night they took the train into New York City, visiting various attractions including seeing EY headquarters in Times Square. The trips provided good practice for getting around big cities, as he visited other offices much of the eight-week internship. “I spent most of my days at on-site client locations. I traveled to Chicago for two weeks at a broker dealer who did a lot of commodities and securities trading. I tended to do something different every day,” he said. The School of Accountancy audit internship program runs the first half of the students’ final semester until spring break. It allows students to experience both the immensity and diversity of what to expect when audit season is in full swing. Setter believes both the curriculum at Nebraska, and the practical experience of on-the-job training, complement one another. During the internship, Setter wrote bi-weekly journals about what he did and how he applied what he learned in class to his work. He completed the internship assignment with a five page paper detailing the entirety of his experiences. On his exit interview, EY offered Setter a position with the firm which he begins in the fall of 2019 after completing his MPA at Nebraska next year.